Specializes in Subarus and diesel vehicles, but works on all makes and models of autos. 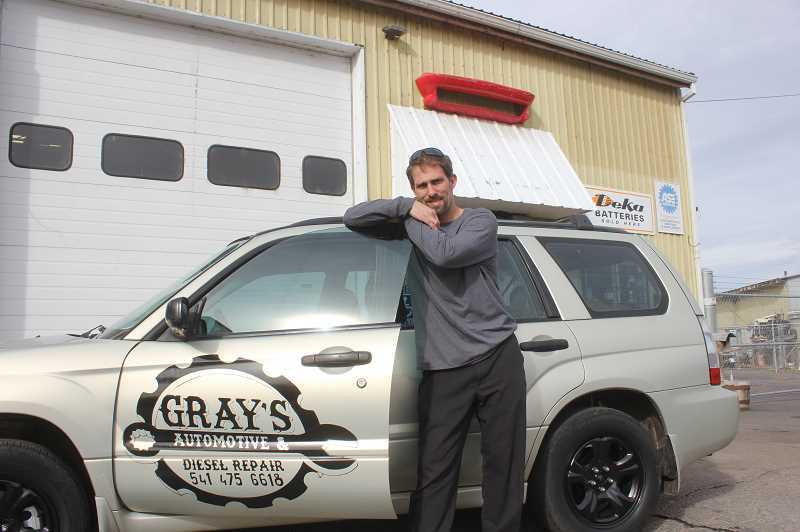 Gray's Automotive and Diesel Repair has opened in the former location of Cliff's Auto Repair. Owner Josh Gray noted that his mentor, Cliff Dwy, retired a few weeks ago and he is leasing the building from Dwy. Gray grew up and went to school in Madras, and worked 14 years for Cliff as an automotive technician, learning on the job. "I was doing house painting until the economy slumped. Cliff needed someone for his tow truck and was willing to train me. In my off time, I learned auto mechanics and worked into a full time position," Gray said. When Dwy decided to retire, Gray said, "He told me I needed to step up and do my own thing, or find another job. So, I decided to open up my own business and use the business management he taught me." He and his wife, Francis, have four children, and she does the bookkeeping for the business. Gray's Automotive is a full service auto repair shop, which specializes in Subaru and diesel repair, but can do all makes and models. "We just don't do tires or alignments," he said. Gray has four employees to work on vehicles, and the shop is open from 8 a.m. to 5 p.m., Monday through Friday, and after hours for emergencies and roadside assistance. Dwy still has the towing business, but Gray runs the tow trucks for him, which are available 24 hours a day. "I've always enjoyed mechanical work and fixing things, and this business gives me the chance to do what I love," Gray said, adding, "In this industry, you have to enjoy what you do. You want to do a good job and you care about your customers." Grays Automotive, located at 330 SW Culver Highway, in Madras, can be reached at 541-475-6618, or after hours at 541-279-7952.